When a visitor requests pages at any LureMaking.com site, our Web servers automatically recognize the browser's domain name, and IP address. Our servers do not record e-mail addresses. We collect the domain names and IP addresses in order to aggregate information on what pages users access or visit. This information is collected solely for statistical purposes and is not used to identify individuals. From time to time, we ask users to provide their e-mail address or mailing address for the purpose of mailing Real Pro's SportFishing's catalogues and other mailing (for example, subscriptions to our print publications, or information about our trade shows). LureMaking.com does not send cookies to your computer. LureMaking.com maintains a strict "no-spam" policy. Your e-mail address will not be sold to a third party if you sign up for one of our e-newsletters. 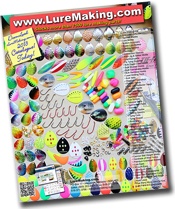 If you sign up for an e-mail newsletter at a LureMaking.com site, you will receive only the e-mail newsletter you have requested. You may receive on occasion an offer to sign up for a new newsletter, but you will not receive additional newsletters or discussion list mailings unless your specifically request them.